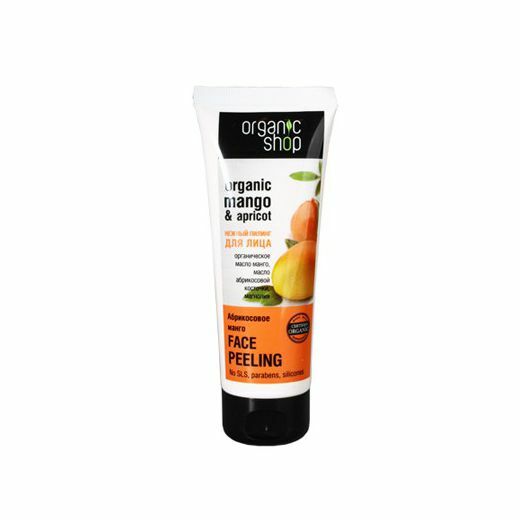 Organic Mango & Apricot Face Peeling is produced by the Russian beauty brand Organic Shop. It is formulated with olive oil, mango seed butter, apricot seed oil, macadamia oil and magnolia extract. The peeling cleanses your skin gently yet effectively, enriching it with nutrients. It has a rejuvenating effect, makes your skin softer and smoother, improves skin elasticity. The product is free of parabens, silicones, SLS, synthetic colourants and fragrances, synthetic preservatives and polyethylene. Contains certified organic extracts and oils. Directions. Apply onto wet skin, spread evenly, leave for 8 to 10 minutes, rinse with water. Ingredients. Aqua, Glycolic Acid, Olea Europaea Fruit Oil, Glyceryl Stearate, Cetearyl Alcohol, Cetearyl Glucoside, Cetyl Pamitate, Glycerin, Organic Mangifera Indica (Mango) Seed Butter, Prunus Armeniaca (Apricot) Seed Oil, Ethylhexyl Stearate, Macadamia Ternifolia Seed Oil, Sodium Hydroxide, Magnolia Liliflora Flower Extract, Panthenol, Benzyl Alcohol, Benzoic Acid, Sorbic Acid, Parfum. Want to buy Organic Mango & Apricot Face Peeling? Call us or submit your order via our web site! This is not the strongest face peel with glycolic acid I've tried, but this actually makes it perfect for frequent use. I have a professionah chemical peel at a salon once a month and then just maintain the effect by using this stuff, it keeps my skin clean until the next visit to the salon.